"I may be young, but I know a darn good cookie when I taste one! I stumbled upon this recipe by mistake, when I didn't have enough of the right ingredient!" Mix together butter, shortening, and sugar. Add eggs and vanilla, then mix. Add flours and baking soda. Stir. Add chocolate chips. Stir. Drop by teaspoonful on greased cookie sheet. DO NOT FLATTEN. Bake for 8-10 minutes. 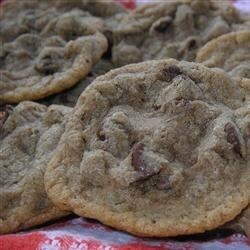 This is one great cookie!! !